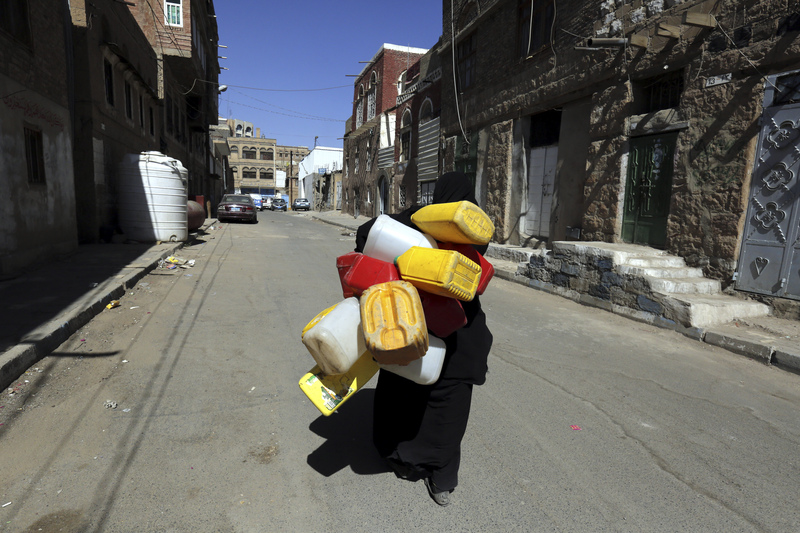 Since 2014 Yemen has been in the midst of a civil war, complicated by a patchwork of domestic fronts and overseas allies leading to a conflict that has pushed more than two million out of their homes and left a third of the country’s population food insecure. The conflict has resulted in severe economic challenges including price inflation and liquidity shortages, coupled with the largest cholera outbreak in modern history – not to mention the disruption of essential infrastructure. In November 2017, price levels for staple commodities soared as the Saudi-led coalition imposed an economic blockade on the country. These developments created a demand for regular market updates, and so in March 2018, REACH supported the Water, Sanitation and Hygiene (WASH) Cluster and the Cash and Market Working Group in establishing the Joint Market Monitoring Initiative or JMMI. 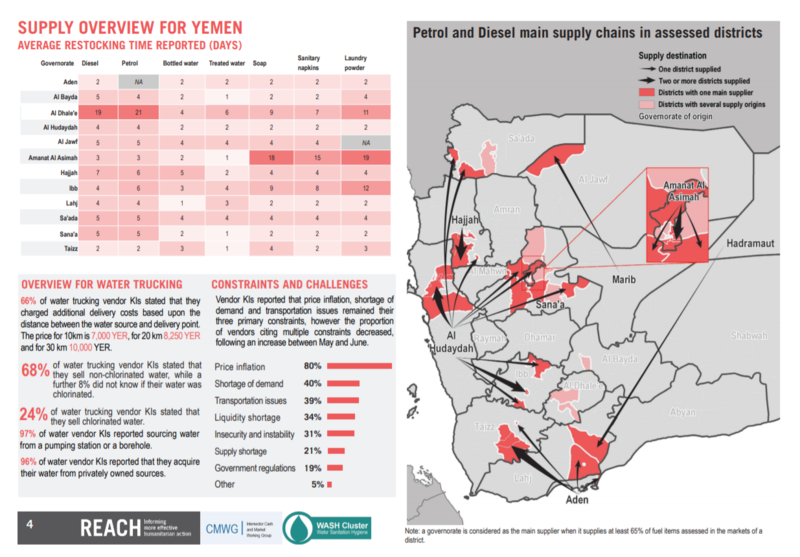 The JMMI has since tracked price levels, supply chains and challenges vendors of fuel, water and hygiene items face across Yemen. During the past months of monitoring, price levels for assessed commodities have largely remained stable, though recent JMMIs have revealed notable variations between regions. Despite the recent intensification of conflict, the port city of Al Hudaydah has remained open, yet the price of fuel in the districts it supplies in the north-west are higher than those in the south-west supplied by the port of Aden. Price inflation remains the most frequently mentioned challenge by vendors across the country, followed by supply shortages and issues in transportation. From a WASH perspective, the most significant finding of the JMMIs has been that reported fact the vast majority of water trucking vendors sell unchlorinated water. This has been noted as a worrying sign in light of efforts to curb the spread of cholera by educating people on the importance to treat water. Furthermore, the JMMI noted that prices for water trucking were the most unstable of all assessed products, influenced by the cost of diesel needed for boreholes and transportation. Findings from the July JMMI measuring restocking times, challenges and supply chains. In July 2018, the WASH Cluster used the data collected for the JMMI to recalculate the transfer values of allowances given to Yemeni households for water and hygiene items. The re-calculated allowances noted the decrease in price levels since the economic blockade was imposed in November. Furthermore, the use of this data illustrates the increasing impact of the information provided by the Joint Market Monitoring Initiative in informing the humanitarian response in Yemen. For a more comprehensive overview of findings from the monitoring initiative, visit Yemen’s page on the REACH Resource Centre and see the findings of the July and August Situation Overviews.